TORONTO (May 22, 2013) – Andy Sutton officially announced his retirement from the National Hockey League (NHL) today, following a 15-year career. As a result of the physical game he played as a defenceman, he endured 12 surgeries for various injuries that caused him to miss a number of games in his career. Notwithstanding, Sutton played in 676 NHL games for seven different NHL teams. He registered 1,134 hits, 1,164 blocked shots and 1,185 penalty minutes, while also scoring 38 goals and 112 assists for 150 points in his career. He was always known for his resiliency, toughness and steady play. At 6’6”, 245 lbs., Sutton was a hulking, stay at home defenceman who was not afraid to sacrifice his body to make a play or save a goal. His dependable play was valued by each team he played for, evident in his average ice-time of 17:42 during the regular season in his career. Sutton’s career in the NHL began with the San Jose Sharks in 1998-99, before he went on to play with the Minnesota Wild, Atlanta Thrashers, New York Islanders, Ottawa Senators, Anaheim Ducks and finally the Edmonton Oilers where he finished his career. Prior to reaching the NHL, he played 121 games in four seasons with Michigan Tech, which included an outstanding senior season in 1997-98 when he scored 40 points in 38 games and was named to the All-WCHA Second Team. While developing his on-ice game in college, Sutton also earned a degree in engineering. Sutton signed with the San Jose Sharks in 1998 and played in his first NHL game on October 20, 1998. After spending the following season with the Sharks, he was traded to the Minnesota Wild on June 11, 2000. Sutton played 69 games in 2000-01 in Minnesota, while leading the Wild in hits (123) and ranking second in penalty minutes (131). On January 22, 2002, he was traded to the Atlanta Thrashers where he played for the better part of the next five years. In the 2003-04 season with the Thrashers, he set career highs in power play goals (7), shots (102) and average ice-time (23:34), while leading all Atlanta defencemen in goals (8) and accumulating a five-game points streak in March of that year. Sutton played for GCK and ZSC in Switzerland during the 2004-05 lockout. In the 2005-06 season, he led the team in penalty minutes (144) and blocked shots (195) – fourth most in the league – while tying a personal best in goals (8) and also registering career highs in games played (76) and points (25), along with plus-minus (+13) which was tops among all Thrashers defencemen. In 2006-07, as part of the first and only Thrashers team in franchise history to make the playoffs, Sutton ranked 19th in the NHL in blocked shots (162) and he played in 55 regular season games and all four playoff games. He played three seasons on Long Island after signing with the New York Islanders in the summer of 2007. In 2007-08, he finished second on the team in penalty minutes (86). In 2008-09, he played in his 500th career game (November 17, 2008 vs. Vancouver). In the 2009-10 season, which he split between the Islanders and Ottawa Senators, he ranked second in the league in blocked shots (204) and eighth among all defenceman in hits (197). In the six playoff games he played for the Senators, he averaged more than 23 minutes of ice-time. In 2010-11, after signing as a free agent with the Anaheim Ducks, he finished fifth on the team in blocked shots (87) and first in plus-minus on the road (+6), and made another playoff appearance. On July 1, 2011, he was traded to the Edmonton Oilers. Sutton was a solid contributor in Edmonton in 2011-12, registering 10 points, a plus-minus rating of +5, 112 hits, 95 blocked shots and 80 penalty minutes in 52 games. 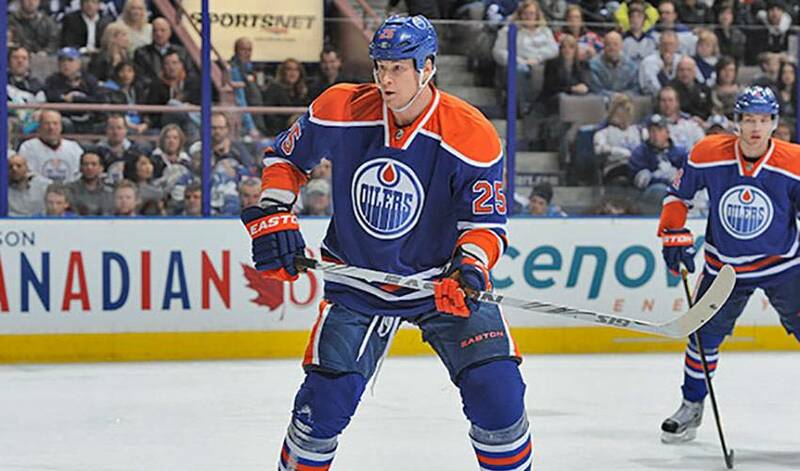 While under contract with the Oilers for 2012-13, he was forced to sit out the entire season due to a knee injury. Andy resides in California with his wife Natalie and daughter Kseniya. He is in the process of licensing the seven technology patents for bodily protection systems that he has been working on for the past few years.